Local Weather concerns – Carl Helmers — Technical Story Teller and Thinker — self publishing again now on the WWW. What you do after founding BYTE, Bar Code News then Sensors dead tree magazines in the prior age. 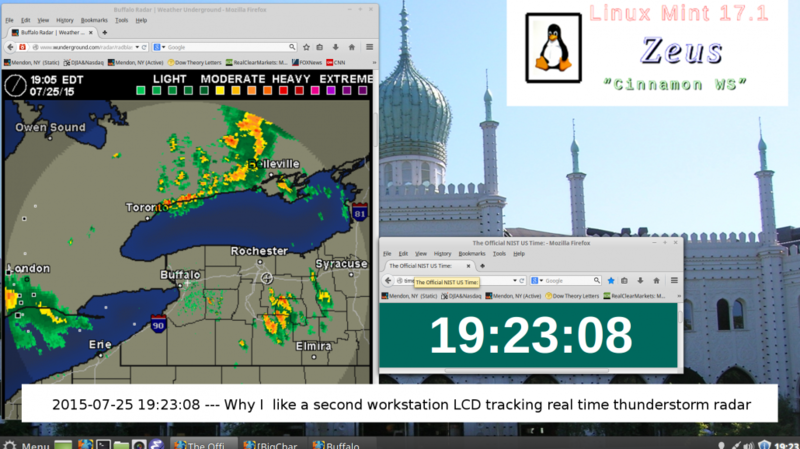 After a bit of GIMP captioning, here is a screenshot that I captured this evening of my second workstation, Zeus, showing a Weather Underground Radar display of our region. Of course if the intensity of the real time lightning symbols get too close and intense near our location (the white “+” in a circle south east of Rochester here) I can usually start hearing thunder as a storm nears. This display gives me plenty of advance warning before I need to take EMP protection measures: Sanely shutdown my software on my computer systems, shut down the computers, disconnect its AC power feeds, disconnect the remaining LAN wires, etc. In the Weather-Underground display of the Buffalo NWS radar that I captured tonight, the black squares that shrink over time represent lighting strikes. In this image, there is a moderate intensity of strokes seen by squares near and under the London Ontario Canada north of Lake Erie and Ohio. While I also disconnect the wired network feeds that could pick up a close lightning EMP transient using the LAN wires / AC feeds as antenae, I do not disconnect the wireless router itself. Why? I can still get the internet feed wire-lessly in my Apple Airbook that runs off batteries while the thunderstorm storm shutdown is in effect. The only system that I leave at risk then is the wireless router which is of course wired to the power mains and to the TimeWarner cable modem, as well as our higher speed legacy LAN wiring I normally use to feed internet from the wireless router to the computers. If the router were to get slagged by a close lighting strike its cost of replacement would only be a hundred dollars or so. In such a case there would likely be a lot worse damage to the rest our home!